Anton Strout, author of INCARNATE, explains HOW TO SURVIVE THE GARGOYLE APOCALYPSE (you know, that old thing)! Every book—if you’re paying close attention, that is—has more than just a story to tell, more so when it comes to those of us who write the fantastical. 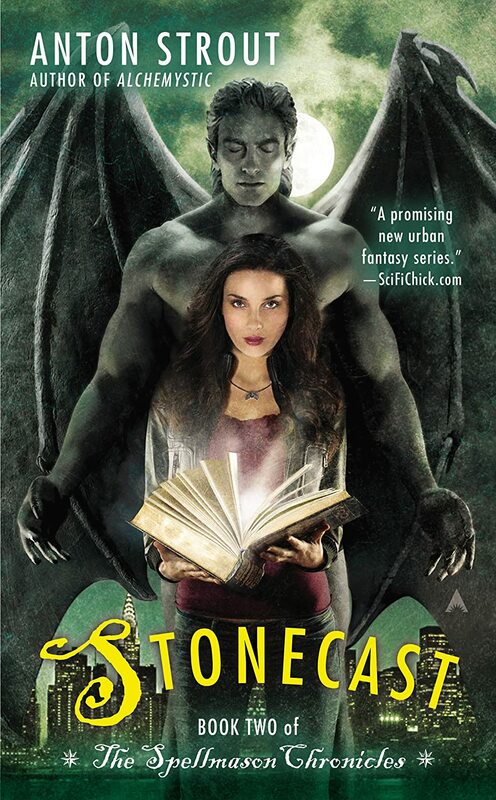 On the surface, The Spellmason Chronicles (ALCHEMYSTIC, STONECAST, and the just released conclusion INCARNATE) seems to be an everyday tale about modern day New York City… with gargoyles, witches, alchemists, and the series-titular arcanists known as the Spellmasons. Under closer inspection of the books, however, you’ll find I’m just looking out for you, dear reader. Everyone out there is oh so busy nowadays coming up with their clichéd zombie survival plans, but I am here to give you the cold hard truth: FEAR THE SKIES! It’s not the shufflers and shamblers you have to worry about. It’s the winged stone denizens coming to life all throughout the borough of Manhattan that you need to arm yourself against. *holds out hand* Come with me if you want to live. Protip: Gargoyles love the buildings they have adorned for centuries. They favorite hobbies are perching and brooding over the city as high as they can go, gazing down through Manhattan’s concrete canyons, ever watchful. That’s why you’re better off if you live outside Manhattan (even New Jersey like yours truly!). The outer boroughs are comparatively flat and unappealing to gargoyle-kind, and you’ll rarely find yourself caught in the middle of warring factions of them duking it out. Forewarned is forearmed, as they say. Whoever they are. I’ve never been clear on that… anyway, art education is key to survival in this upcoming stone age, allowing you to ‘know your enemy’. First, studying art and architecture will help you identify, classify, and tell friend from foe by learning the finer points of each and every statue come to life. Second, these warring factions of winged creatures are going to be doing a lot of damage to this city and each other. A skilled art student could really make some bank or have their life spared by proving of use to gargoyle-kind by offering sculpting repair services to their chipped and combat damaged wings and forms. Depending on whether you are a pessimist or an optimist, having friends during a gargoyle outbreak is a help whatever your point of view. For instance, you could see your “friends” as something to shove towards a gargoyle that’s menacing you, buying you a little time to escape. Some friend you are! Or, as in the case of The Spellmason Chronicles, friends are a vital component in survival, letting those around you help out by letting them play to their strengths. Spellmason Alexandra Belarus surrounds herself with loyal compatriots, who also happen to have some skills when it comes to pushing back their stony enemies: Marshall Blackmoore- an amateur alchemist with a penchant for critical thinking when it comes to dealing with the fantastical thanks to years of playing Dungeons & Dragons, Rory Torres, her oldest friend since childhood who functions as a dancer turned modern day paladin who dares to arm herself with an old world pole arm on the streets of Manhattan. As well as you should know your enemies and know your friends, you should also know yourself. Talk to your relatives. Maybe—like heroine Alexandra Belarus—you too will discover that your great-great grandfather was the last practicing Spellmason—an arcane artist able to breathe life into living stone. Then you too can build your own army of gargoyles and protect the fine city of New York. See? Simple! Sorry. Didn’t mean to be so flip there. Chances are in reality you’re just going to get torn to bits by clawed stone golems, but on the plus side: You’ll feel better that you at least read an article that had the potential to help you survive. But if you want to increase your chances at living? It’s probably in your best interest to check out INCARNATE and the rest of The Spellmason Chronicles while you’re at it for all the secrets to surviving the upcoming gargoyle-maggedon. Want to win a cool giveaway prize, courtesy of the super brilliant Anton Strout? Click here for further details! Oh, and order his books. His books ROCK. Everything changed when Alexandra Belarus was saved by her family's ancient protector, Stanis. Now that she's uncovered the truth behind her family and their abilities in Spellmasonry, she's got a host of evil watching her day and night. Can she survive, even without Stanis?